At a time when people are generally retiring later and living longer, I guess it could be said that 'sixty is the new forty'. Nevertheless, as I approach my sixtieth birthday, there is a sense in which the turning of the decade has a particular significance. There can now be little doubt that far more of my life lies behind me than ahead of me. In terms of my working life and ministry, I've still got some years to go - God willing - and yet retirement looms on the horizon, bringing with it a welcome release from any vestige of ambition or 'career' anxiety. Plenty of people told me this would happen. I was warned many years ago that I would one day wake up and wonder where all the years had gone. At that time, of course, I simply laughed, just as my younger friends and colleagues do now as I utter the same words of wisdom to them; and more recently friends have warned me that reaching sixty would bring with it a more reflective frame of mind, of which I suspect this blog is evidence, albeit slightly premature! It used to be said, of course, that life begins at forty. If sixty is indeed the new forty, then I say "Let life begin!" Actually I think it already has. It's breaking through in the greater readiness to speak my mind more openly while caring little about the consequences. (Whether the resulting comments are perceived as the onset of a Victor Meldrew-style grumpiness or a refreshing and amusing outspokenness depends I guess on where you are in the conversation in question.) It's breaking through too in my approach to ministry which is freed from anxieties about getting things wrong in a way that could adversely affect my future. I'm often told that I've never been risk-averse and whilst I wouldn't want recklessness to be listed as a characteristic in my obituary, I'm pleasantly surprised that getting older has not - so far at any rate - made me any more fearful of risk. Indeed I suspect that if we don't live dangerously we don't live at-all. I can remember an old priest friend of mine - long since 'promoted to glory' - who was approaching retirement and attended a retreat led by Bishop Stephen Verney, author of 'Water into Wine - An introduction to John's Gospel'. Apparently the Bishop, with an obvious allusion to the Wedding at Cana - had suggested that it was often the case that God saved the best wine until last, and that the latter years of life and ministry could be the most enriched and rewarding. Much of this depends, I guess, on one's physical and mental health, but I certainly count myself as fortunate that I now feel happier, more settled and angst-free than I have for many years. This is not to say that I have any complaints about the past. Inevitably as I approach sixty, I find myself 'taking stock' of how I've spent my life and what I've done, and I count myself very fortunate in being able to say that although it has taken some unexpected and challenging twists and turns, and although I have had plenty of struggles and heartache, there is nothing that I significantly regret. More than one friend has recently observed that there's a sense in which, at least in my spiritual life, I have come almost full circle. In rediscovering Charismatic Spirituality within the Catholic Tradition that has nurtured me for most of my life, I have in some respects returned to the beginning of my earthly pilgrimage. But I don't see anything wrong with that; far from it. I think it is a common mistake to perceive life's journey as being linear rather than circular, and revisiting the past armed with new insights and experiences can, I believe, represent a spiral ascent rather than a linear dead-end or a cyclic trap. For me, there is a growing sense of 'completeness' in this process. 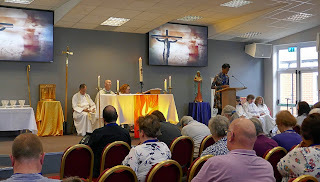 Similarly, although I left full time ministry many years ago (not expecting to ever return) and then had a series of secular jobs, I met some wonderful people during that period, and I gained invaluable experiences which I later carried back into my return to parish ministry. I wouldn't have wanted to miss out on those relationships and experiences and yes, I would do it all again. Whether the Almighty is saving the best wine until last remains to be seen; all I can do is journey on in faith into whatever future he has for me, but I have to be honest and say I am even now beginning to look forward to being freed from my parish priest 'In Tray' and from the growing administrative and managerial demands of full time parochial ministry. When the time comes, I'm sure I will miss having a 'flock' of my own, however wayward and frustrating (but nevertheless love-able) they may sometimes be, but I will be glad to be set free (subject to the appropriate Episcopal permissions, of course) to just be a priest doing priestly things and doing so as a 'servant' rather than constantly striving to be a 'leader' as required by today's CofE. That is, of course, always assuming that I choose to remain part of the Church of England. Today's Church bears little resemblance to that into which I was ordained thirty-three years ago. Of course, this is to be expected - only something dead remains unchanged - but it would be both absurd and dishonest to suggest that all the changes have been for the better. My chief concerns continue to be the erosion of the CofE's true Catholic identity, the loss of its tolerance and breadth and its failure to be truly inclusive, and an over-emphasis on leadership which is locked into an overly secular managerial mind-set. Should all of this get too much to bear, ironically the starkly-contrasting options would be conversion (as a layman) to Roman Catholicism or a total abandonment of the church per se. Neither would be without major adjustments and sacrifices, but whilst at the moment I can't imagine living without the sacraments, I must confess to a certain envy of those who in retirement have found plenty to nourish their spirituality and their love affair with God without the need for institutionalised religion. All that, however, is to come. Will God save the best wine till last? Time will tell. In reality of course, at that wedding feast in Cana, there was no best wine that had been saved. The 'best wine' emerged as a result of the transforming touch of Christ. So it is for those of us who love and follow him as we allow him to transform the water of our lives into wine regardless of our age and where we are on our journey through life. Whether we're forty or sixty, life truly begins with that transforming touch.